This recipe makes for a delicious, filling soup. Leeks are in the same family as onions, but have a mild flavor that complements the other ingredients without overpowering them. This recipe can be made without oil by slowly cooking onions and garlic in a covered pot until the onions are translucent. Also, you can substitute frozen broccoli if fresh is unavailable. Additionally, cannellini beans can be easily substituted with navy, great northern or even garbanzo beans. In a four-quart, pot sauté the onions on medium heat in olive oil until transparent. Add garlic and cook without browning while stirring frequently, about 2 minutes. Add the diced leeks and sauté 2 minutes. Add the vegetable stock, increase heat and bring to a simmer. 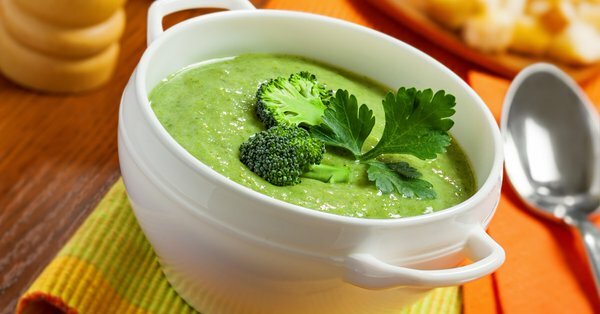 Add the cannellini beans and broccoli florets or two 10-ounce packages of frozen broccoli florets and simmer on medium heat until broccoli is lightly cooked but still crunchy. Add salt and pepper, turn off the heat and blend with an immersion blender until completely pureed. Previous PostPrevious Mary Flahavan’s Rhubarb Crumble!